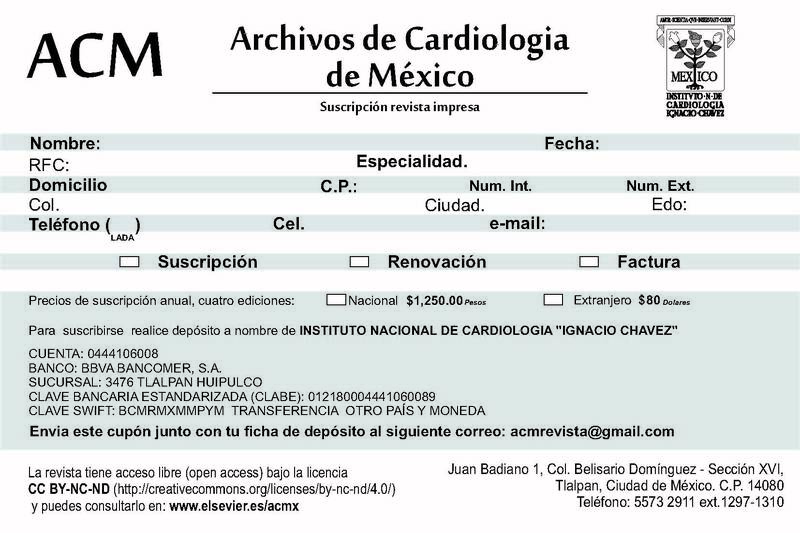 La revista Archivos de Cardiología de México representa el órgano oficial del instituto Nacional de Cardiología Ignacio Chávez, de la Sociedad Mexicana de Cardiología y de los internos y becarios del instituto que es SIBIC-Internacional. Es una publicación que recibe manuscritos en idioma español e inglés que tiene todas las facilidades modernas de la vía de la electrónica para la recepción y aceptación de las investigaciones cardiovasculares clínica y experimental. Cardiopatías congénitas en niños y adultos. Todos los artículos son evaluados por pares doble ciego por el comité editorial y no serán revisados entre los miembros de la misma institución. La mayor parte del espacio se destinará a trabajos originales, el resto a revisión de temas cardiológicos y a comunicaciones breves. Se publicarán en fascículos trimestrales tanto en forma impresa como en revista electrónica de acceso libre. Se reservará un lugar para noticias médicas. La revista cuenta con un software Crosscheck que permite analizar cada documento comparándolo con todos los documentos que existen online para evaluar coincidencias. No se permitirán prácticas fraudulentas con particular como la falsificación de datos, duplicidades y el plagio . PubMed/MEDLINE, SCOPUS, Biological Abstracts, Artemisa, Biosis, Healthstar, Pascal, Índice de revistas mexicanas de investigación científica y tecnológica, (CONACYT), Cancerlit, Toxfile, Free Medical Journals, Bibliorama, Inside Conferences, Compendex, Geobase, Scopus, ISI-Master Journal List, Latindex, MD Consult Core Service (Elsevier), OCLC (A Worldwide library cooperative), Periódica (Índice de Revistas Latinoamericanas en Ciencias), SIIC (Sociedad Iberoamericana de Información Científica), Ulrich/s International Directory, Biosis Toxicology, Embase Alert. Corresponding author at: Puente de Piedra #150, Colonia Toriello Guerra, C.P. 14050 Delegación Tlalpan, México, Distrito Federal, Mexico. Takotsubo Cardiomyopathy mainly occurs in postmenopausal women, with or without cardiovascular disease, and is commonly associated with emotional or physical stress. After nearly 27 years of extensive efforts towards a better understanding of this disorder, current knowledge remains limited. Many people suffer post-traumatic stress, and this situation can be associated to stress cardiomyopathy. The case is presented of a female who suffers stress associated with the earthquake of 19 September 2017 in Mexico City, and arrived in the Emergency Department in cardiogenic shock. La miocardiopatía de Takotsubo ocurre principalmente en mujeres posmenopáusicas con o sin enfermedad cardiovascular, y se asocia comúnmente con estrés emocional o físico. Después de casi 27 años de esfuerzos extensos para una mejor comprensión de este trastorno, el conocimiento actual sigue siendo limitado. Muchas personas sufren estrés postraumático y esta situación puede estar asociada a la cardiomiopatía por estrés. Presentamos el caso clínico de una mujer que sufrió estrés relacionado con el pasado terremoto del 19 de septiembre en la Ciudad de México y llegó al servicio de urgencias en choque cardiogénico. Last September 19, 2017 a 7.1 Richter magnitude earthquake killed more than 300 people in Mexico City and toppled dozens of buildings. Many people suffer post-traumatic stress and this situation can be associated to stress cardiomyopathy. It is important for all involved clinicians to recognize the diagnosis and possess knowledge about the evaluation of these affected patients. We presented the case report of a female who suffer stress related with earthquake and arrived to emergency department presenting cardiogenic shock. A 79-year-old postmenopausal female presented to the emergency department (ED) with a chief complaint of chest tightness. The patient reported high intensity oppressive thoracic pain, with irradiation to the back, associated with nausea, vomiting, and diaphoresis. On the previous 15h, the patient was rescued under the rubble that fell on her body, being the victim of the earthquake of September 19, 2017, in Mexico City. The patient's past medical history included hypertension and dyslipidemia. Medications upon admission included, valsartan/hydrochlorothiazide 80/12.5mg daily. Cardiovascular risk factors were: age, stress, dyslipidemia and hypertension. Upon presentation, the patient had 53mmHg of systolic BP (blood pressure) and 22mmHg of diastolic BP, heart rate 85beats/min, oxygen saturation 82%, weight 60kg. Initial cardiac markers were elevated with mioglobine 133.3ng/ml (17.4–105.7), creatine phosphokinase (CPK) muscle and brain (MB) 13.4ng/ml (0–4), and Troponin-I 3.77ng/ml (<0.04). Electrocardiogram results showed normal sinus rhythm, ST elevation in aVR, I and aVL, and minimal ST depression in the rest of the leads (Fig. 1). The patient immediately had cardiac catheterization with left ventriculography. The cardiac catherization revealed non-dominant right coronary without lesions, short left main coronary artery without lesions, left anterior descending artery without lesions, dominant left circumflex artery without lesions, 40% plaque in proximal posterolateral artery. The ventriculography report apical ballooning (Fig. 2). The echocardiogram showed left ventricular apical anterior, apical inferior, apical lateral and apical septum segments were akinetic, with compensatory hyperkinesis of all basal portions, an estimated left ventricular ejection fraction of 30% and severe mitral regurgitation (Fig. 3). She was admitted to the coronary unit, where the patient received mechanical invasive ventilation which retired on the second day, she was in cardiogenic shock with hypotension: 47mmHg of systolic BP and 51mmHg of diastolic BP mmHg, hypothermic T 35°C, treated with norepinephrine, vasopressin and levosimendan, which were removed on the second day. On the third day, the electrocardiogram of control was normal, echocardiogram with minimal apical hypokinetic, the rest of the left ventricular segments were normal, ejection fraction of 60% and CPK 501U/l, CPK MB 13ng/ml, Troponin-I 14.15ng/ml. She was successfully discharged from the hospital. (A) Electrocardiogram results showed normal sinus rhythm, ST elevation in aVR, DI and aVL, and minimal ST depression in the rest of the leads. (B) Electrocardiogram after cardiac catheterization is normal. Cardiac catheterization demonstrating left ventriculography in diastole (A), and “apical ballooning” in systole (B). The echocardiogram showed left ventricular apical anterior, apical inferior, apical lateral and apical septum segments were akinetic, with compensatory hyperkinesis of all basal portions in systole; four chamber view (A), three chamber view (B), two chamber view (C), and short axis view (D), and normal diastole; four chamber view (E), three chamber view (F), two chamber view (G), and short axis view (H). Takotsubo syndrome is classified as both a primary and an acquired cardiomyopathy by the AHA, and as an unclassified cardiomyopathy by the ESC.15,16 The etiology of TTC remains uncertain and it is likely that multiple factors are involved. A characteristic feature of the syndrome is its association with an identifiable stressful event, ranging from what may be considered an emotionally stressful event without a physical component to a physical stressor, although in up to one-third of patients, no trigger can be identified. The emotional distress and chest pain after the earthquakes as this case were diagnosed in Niigata, Japan in 2004, earthquakes in Christchurch, New Zealand, in 2010 and 2011 and in the USA in 2011 during Hurricane Irene, the worst tornado outbreak to hit the USA to date.1,2,5,6,17–20 The 2017 central Mexico earthquake struck at 13:14 CDT on September 19, 2017 with a magnitude estimated to be 7.1 and strong shaking for about 20s. Many people after an earthquake are sometimes dismissed or managed with benzodiazepines and physiological consult. While emotional support needed for survivors after an earthquake, also these victims should be in the emergency department. Takotsubo syndrome is a cardiomyopathy reported for 27 years, however, a worldwide consensus has not been established for diagnosis, and the Mayo Clinic diagnostic criteria are the most widely used in clinical practice and research, pathophysiology is complex and may be multifactorial. The etiology of takotsubo cardiomyopathy remains uncertain and it is likely that multiple factors are involved. We report a case of a postmenopausal woman who, after the earthquake, arrived to ED, had a cardiogenic shock secondary to Takotsubo syndrome with early diagnosis and adequate response to treatment during the acute stage. Authors declare none conflict of interest. K.C. Potu, A. Raizada, M. Gedela, et al. Takotsubo cardiomyopathy (broken-heart syndrome): a short review. C. Templin, J.R. Ghadri, J. Diekmann, et al. F. Pelliccia, J.C. Kaski, F. Crea, et al. Takotsubo cardiomyopathy, or broken-heart syndrome. Y.J. Akashi, H.M. Nef, A.R. Lyon. Epidemiology and pathophysiology of takotsubo syndrome. A. Deshmukh, G. Kumar, S. Pant, et al. Prevalence of takotsubo cardiomyopathy in the United States. K. Murugiah, Y. Wang, N.R. Desai, et al. Trends in short- and long-term outcomes for takotsubo cardiomyopathy among medicare fee-for-service beneficiaries, 2007 to 2012. A.S. Minhas, A.B. Hughey, T.J. Kolias. Nationwide trends in reported incidence of takotsubo cardiomyopathy from 2006 to 2012. S.M. Patel, R.G. Chokka, K. Prasad, et al. Distinctive clinical characteristics according to age and gender in apical ballooning syndrome (takotsubo/stress cardiomyopathy): an analysis focusing on men and young women. N.F. Ehl, M. Zurek, H. Rickli, et al. “Double takotsubo”: first description of the sequence of classical followed by inverted type in a young woman. C. Delmas, O. Lairez, E. Mulin, et al. Anxiodepressive disorders and chronic psychological stress are associated with tako-tsubo cardiomyopathy: new physiopathological hypothesis. M.R. Summers, R.J. Lennon, A. Prasad. Pre-morbid psychiatric and cardiovascular diseases in apical ballooning syndrome (tako-tsubo/stress-induced cardiomyopathy): potential pre-disposing factors?. Epidemiology, pathogenesis, and management of takotsubo syndrome. B.J. Maron, J.A. Towbin, G. Thiene, et al. Contemporary definitions and classification of the cardiomyopathies: an American Heart Association Scientific Statement from the Council on Clinical Cardiology, Heart Failure and Transplantation Committee; Quality of Care and Outcomes Research and Functional Genomics and Translational Biology Interdisciplinary Working Groups; and Council on Epidemiology and Prevention. P. Elliott, B. Andersson, E. Arbustini, et al. Classification of the cardiomyopathies: a position statement from the European Society Of Cardiology Working Group on Myocardial and Pericardial Diseases. W.V. Vieweg, M. Hasnain, B. Mezuk, et al. Depression, stress, and heart disease in earthquakes and takotsubo cardiomyopathy. H. Watanabe, M. Kodama, Y. Okura, et al. Impact of earthquakes on takotsubo cardiomyopathy. C. Chan, J. Elliot, R. Troughton, et al. Acute myocardial infarction and stress cardiomyopathy following the Christchurch earthquakes. Y.J. Akashi, H.M. Nef, H. Möllmann, et al. A. Prasad, A. Lerman, C.S. Rihal. Apical ballooning syndrome (tako-tsubo or stress cardiomyopathy): a mimic of acute myocardial infarction. A.H. Frangieh, S. Obeid, J.R. Ghadri, et al. ECG criteria to differentiate between takotsubo (stress) cardiomyopathy and myocardial infarction. S.W. Sharkey, D.C. Winderburg, J.R. Lesser, et al. Natural history and expansive clinical profile of stress (tako-tsubo) cardiomyopathy.